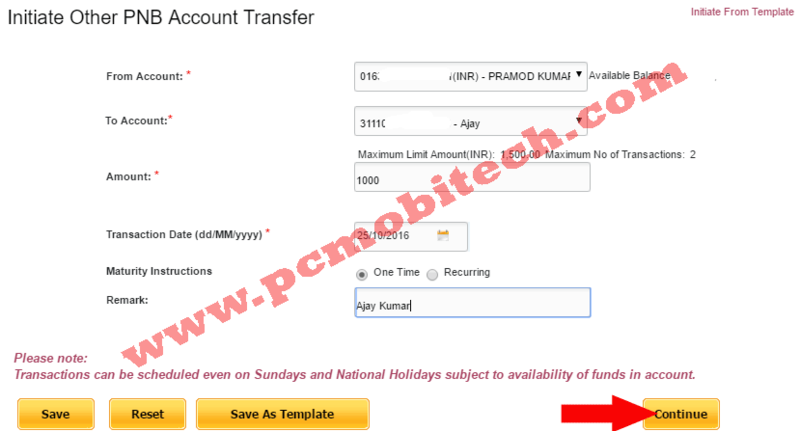 How to transfer (Fund) money using PNB NetBanking. Are you using PNB Internet Banking service and want to transfer fund (money) through your Punjab National Bank NetBanking account. But don’t understand how to do this. Then here I’ll share step by step guide with that you can transfer fund using PNB Internet Banking account. As we know that today net banking facility most important for us and Net Banking or Cashless banking uses increasing day by day. So this is most important for us that learn how to transfer our money to other payee account using Internet Banking service. But before to transfer fund you will need to set first “Maximum Beneficiaries to be added in a day limit” and after that, you can add a Beneficiary to your account. Beneficiaries are those people, in whose account you want to transfer fund. So for security reason first you’ll need to set Maximum Beneficiaries to be added in a day limit. After login click on Set Limits option from available on left in My Shortcuts options. User Limit Set screen will appear. Now Set Number of Beneficiaries Per Day Limit. In the No of Beneficiaries Per Day box enter the total beneficiaries that you want to add per day. If you do not add to-many Beneficiaries per day then the limit can be set 1 or 2. Here you can also set transfer fund limit and the number of transactions per day limit for Overall Transaction, Within PNB Transfers, RTGS Transaction, Credit Card Payment, NEFT Transaction and E-Commerce Transactions. After setting up click on Continue Button. Now you’ll receive an OTP code to your Bank registered mobile number. Which you’ll need to enter on Next page in One Time Password box. And After entering click on Submit Button. You have been successfully set Maximum Beneficiaries to be added in a day limit. Go to Transaction menu available on the top menu bar and choose Manage Beneficiaries option available in Beneficiaries management section. Now you will see Manage Beneficiaries screen. 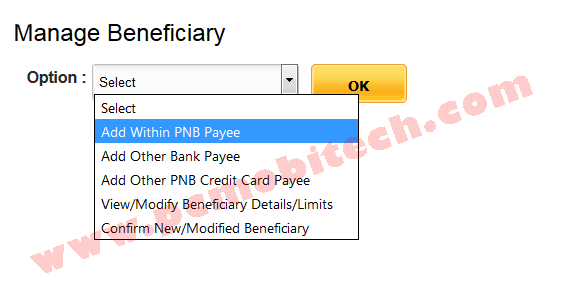 Now select option Add Within PNB Payee if the beneficiary has the account in PNB (doesn’t matter account is in the same branch or in other PNB Branch.) and click on OK button. For Example, here I’m going to add a payee who has the account in PNB Bank, So I have chosen Add Within PNB Payee option and clicked OK button. Nickname: Give a Nick name, an easy name which you can remember. Account Number: Here enter beneficiary account number and click on Validate button. 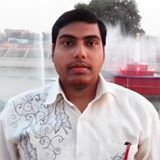 It will automatically fetch account holder name. Maximum Limit Amount: Specify how much fund you want to transfer in a day. eg: 10000. 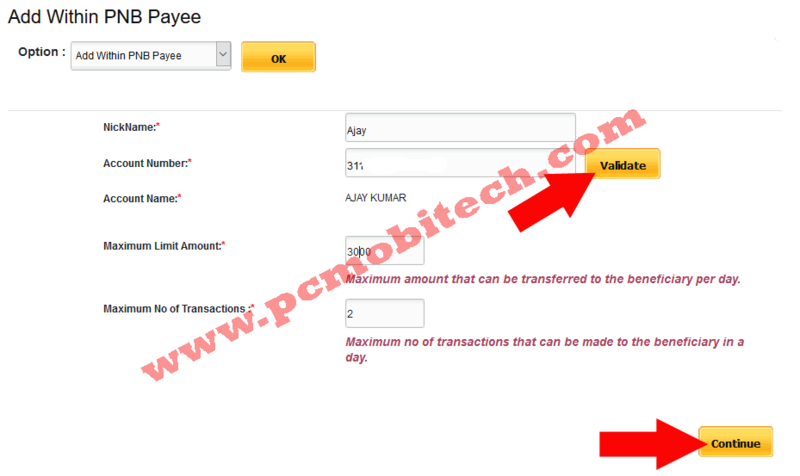 Maximum No of Transactions: Here you can set number of transaction in a day limit. After filling above information click on Continue button. On Next Page you’ll need to verify your Transaction Password. So enter Transaction password and click on Submit Button. Now then Beneficiary has been added to the unverified list. So you’ll need to verify Beneficiary and For the verification, you’ll also receive an OTP (One Time Password) to your registered mobile number. To Verify Beneficiary click on Confirm Your Beneficiary button. On Next you’ll get Confirmation List Page If you have not received OTP yet then generate OTP using Reset OTP button. if you have more than one payee then choose the beneficiary name by the select radio button. And after that click on Confirm Button. On Next Preview Confirmation Details page will appear. Here Enter the OTP code which you have received on your registered mobile number and click on Submit Button. Beneficiary account has been successfully added to Payee list. And now you can send the Payment to the beneficiary account. Name: Fill beneficiary account name, must be match with account name. NickName: Give any easy to remember name as you wish. Account Number: Enter the correct beneficiary account number. Confirm Account Number: Reenter the account number. IFSC Code: Enter the Beneficiary account bank IFSC Code and click on LookUp button. It will automatically Fetch Bank name and bank address details. Address: Enter beneficiary home address which should also match with the beneficiary bank account address. Maximum Limit Amount: same as described above. Maximum Number of Transactions: Same as above. After filling the information tick the checkbox I have read and I accept the terms and conditions and click on Continue button. 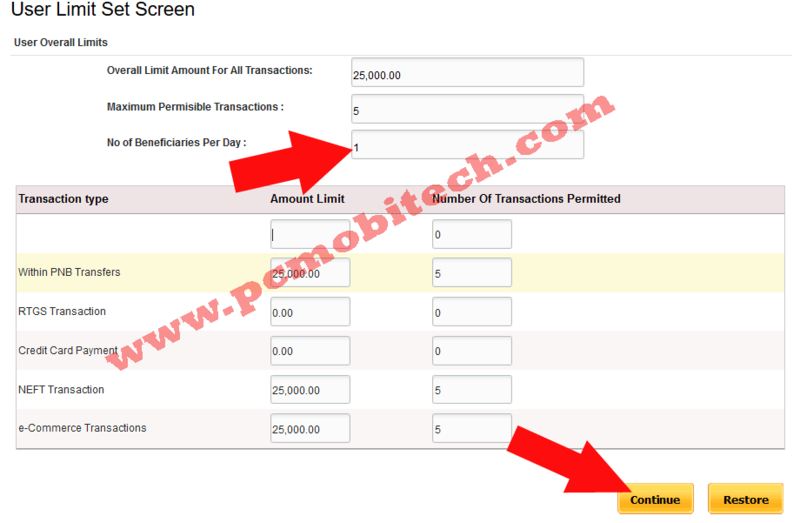 Go to Transaction menu and choose Other PNB Accounts option. And you’ll see Initiate Other PNB Account Transfer page. Here select the beneficiary account number from To Account dropdown list. Enter an amount that you want to transfer. Choose a Transaction Date on which you want to issue fund (money) if you want to transfer fund instant then don’t do anything. Now select Maturity Instructions: One Time or Recurring. If you are making the Recurring transaction (a transaction which automatically transfers in a Regular interval.) For Example, you are doing a payment which you want the issue on date 25/12/2016 and if you choose the recurring option then the transaction will be automatically done again on next 25th date 25/01/2017 and it continues until you’ll not stop this payment. 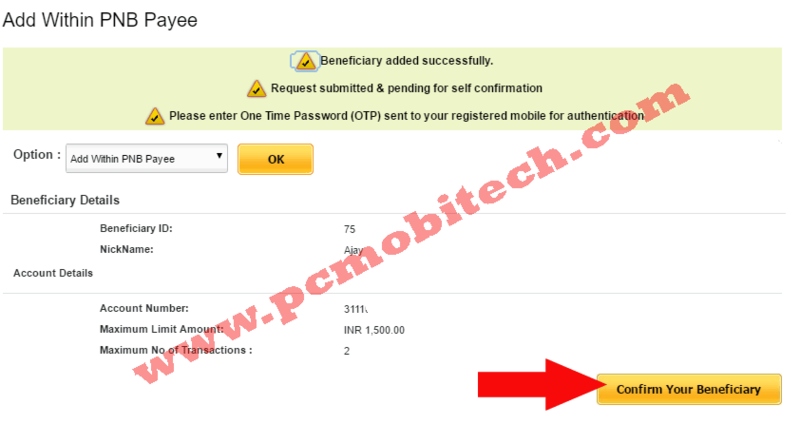 So if you are making the one-time transaction then select One Time option. In Remark, You can leave a message that will remind you why you have done this transaction. After filling all the information click on Continue button. On Next page enter your Transaction Password and click on Submit button. And the transaction has been successful. Go to Transaction menu and choose NEFT option, IMPS Using IFSC (27*7 Instant Transfer) option can be also used if the NEFT is not available but IMPS cost you more charge than NEFT. So first try NEFT option. And you will see Initiate NEFT Payment page, here select and fill information same as I have described above on Initiate Other PNB account transfer page. 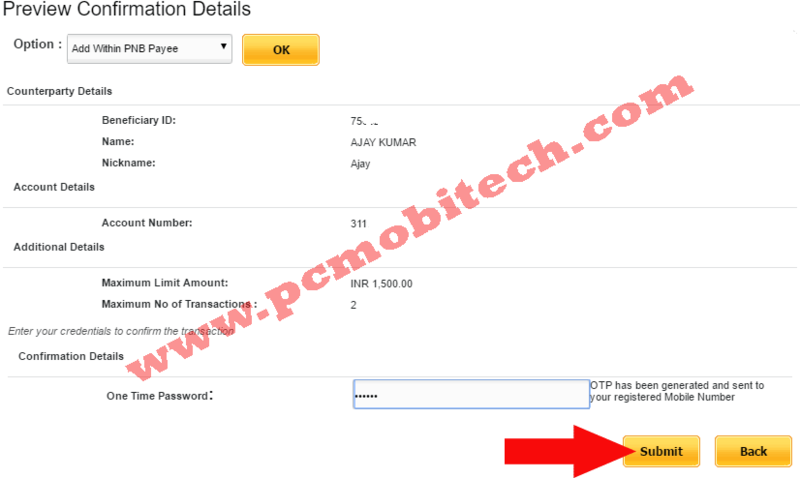 on Next Page verify Transaction password and click on Submit button. Other Bank fund Transfer has been succeeded. Any Question related the post? Full registration process PNB mobile banking online. How to activate PNB Mobile banking app. 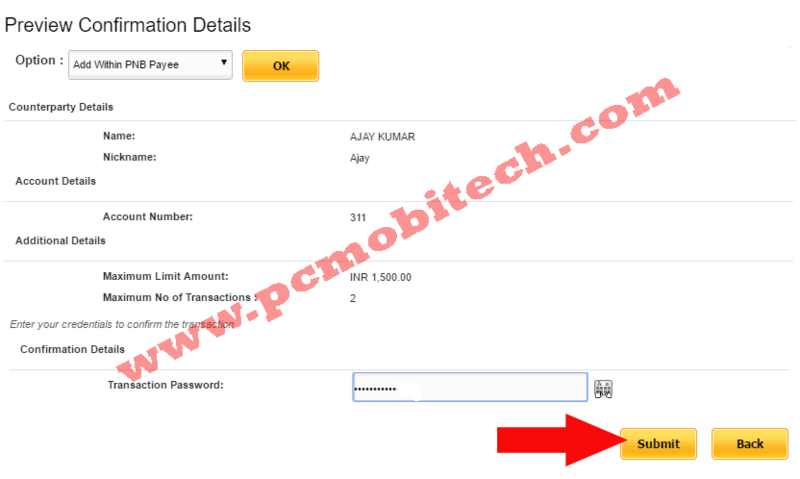 How to lock-Unlock ATM/Debit Card and Credit card?